It is not just the IT/ITES companies, but virtually all service and manufacturing organisations need to ensure some level of information security. 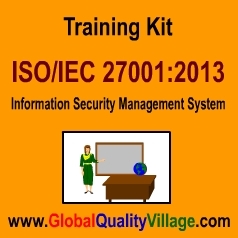 If you plan to implement ISO/IEC 27001:2013 information security management system in your company, you need to impart organization-wide training on information security and ISO/IEC 27001:2013 requirements. If your company is already certified to ISO/IEC 27001:2013, there is still a need for imparting training to the new recruits. To learn the steps involved in system design, implementation and ISO/IEC 27001:2013 certification. What is ISO/IEC 27001:2013, who issues ISO/IEC 27001:2013 certificate, Gantt chart of a typical ISO/IEC 27001:2013 implementation project, etc. ISO/IEC 27001:2013 requirements (clause-wise details).